The overhead line conductors are supported on the poles or towers. In order to prevent the flow of current to earth through supports, the line conductors must be properly insulated from supports. This is achieved by securing line conductors to supports with the help of overhead line insulators. These insulators provide necessary insulation between the line conductors and supports and hence prevent any leakage current from conductors to earth. Thus the over head line insulators play an important part in the successful operation of power system. High mechanical strength in order to withstand conductor load and wind load. High insulation resistance in order to prevent leakage current. High relative permittivity of the insulator material used so as to have high dielectric strength. The insulator material should be nonporous; free from impurities and cracks otherwise permittivity of the insulator material will be lowered. High ratio of rupture strength to flashover voltage. The insulator material should not be affected by the change in temperature. The materials used for insulators used in overhead transmission lines are porcelain, glass, stealite and special composition materials. The most commonly used material is porcelain whereas the other materials viz. glass, stealite etc. are only used to a limited extent. Porcelain is produced by firing at a controlled temperature a mixture of kaolin, feldspar and quartz. This material is preferred over glass since it is mechanically strong; its surface is not affected by dirt deposits and is less susceptible to temperature changes. The dielectric strength of a porcelain insulator is 60 kV per cm of its thickness and it’s compressive and tensile strengths are 70000 kg/cm2 and 500 kg/cm2 respectively. The pin type insulator is screwed onto a galvanized steel bolt which in turn is installed on the cross-arm of the pole. 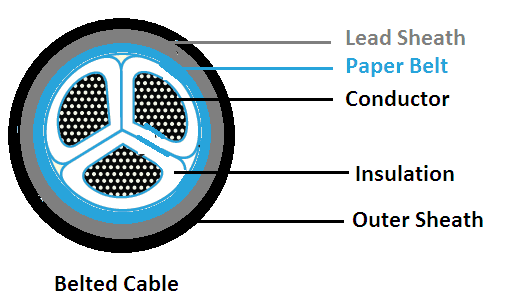 The electrical conductor is placed in the groove at the top of the insulator and is tied down with annealed (soft) wire of the same material as the conductor as shown in the figure. For lower voltages generally, one-piece type of insulator is used. These insulators may have one, two or three rain sheds or petticoats. These rain sheds are so designed that when these insulators are wet (its outer surface is almost conducting due to rain, water), even then a sufficient dry space is provided by the inner sheds. For higher voltages, the thickness of the material required for insulation purposes is more and because of practical difficulties, a quite thick single piece insulator cannot be manufactured. Hence, for higher voltages, two or three piece insulators are jointed. In this case a number of shells (pieces) are fixed together by portland cement. These insulators are designed up to 50 kV because beyond this voltage they become uneconomical. The modern practice is not to use these insulators beyond 33 kV. 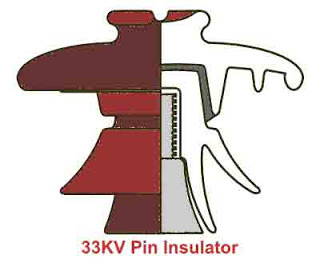 Up to 33 kV, pin-type insulators are preferred over suspension type insulators because firstly they are cheaper in cost. Secondly, they require shorter poles to give the same conductor clearance above the ground since they raise the conductor above the cross-arm while the suspension type insulators suspend it below the cross-arm. As line voltage increases, the pin-type insulator to be used becomes costly, bulky and complicated in construction. Further, the replacement of the damaged insulator will cost more. Therefore, this type of insulator is not economical beyond 33 kV. For higher voltages (more than 33 kV), it is usual practice to use suspension type insulators. They consist of a number of porcelain discs connected in series by metal links in the form of a string as shown in the figure. The string is screwed at the top to the cross-arm of the tower while the conductor is suspended at the bottom. 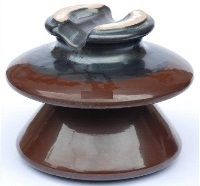 Each unit or disc of suspension insulator is designed for 11 kV so by connecting a number of such discs in series, a string of insulators can be designed for any required voltage. These insulators are cheaper than pin type insulators for voltages more than 33 kV. In the case of failure of any disc the whole string does not become useless. Rather the damaged disc is replaced easily and at a lesser cost. The string of suspension insulators is more flexible therefore it is free to swing in any direction. Hence, it takes up a position where it experiences only a pure tensile stress. By the use of suspension type insulators, the line conductors are less affected by lightning, since they are placed below the cross arm which is earthed and acts as a lightning arrestor. If the load to be transmitted by the line increases, the increased demand can be met by raising the line voltage than to provide another set of conductors. 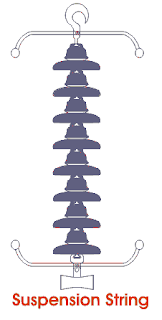 This can be achieved by adding one or more discs to the existing strings. For the same conductor clearance from the ground, higher towers are required since the conductors are placed at the lowermost discs. Larger spacing between conductors is required due to the large amplitude of the swing of the conductors. However, these disadvantages are not so serious; therefore, suspension type insulators are invariably employed in the overhead lines working at the voltages more than 33 kV. At the dead ends, on sharp turns, at the river crossings or at the corners, the line is subjected to greater strains. 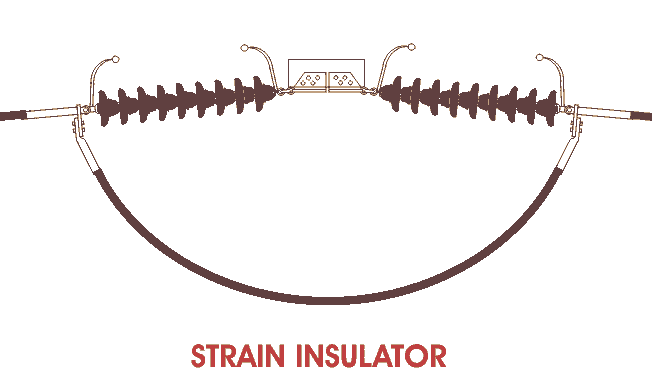 In order to withstand the excessive strain, strain insulators are used in overhead transmission lines. For low voltage lines (below 11 kV) shackle insulators are used but for high voltage transmission lines strain insulators consisting of an assembly of suspension insulators are used. When the pull on the string of suspension insulators is high such in the case of long spans across the river, two or more strings are used in parallel. These insulators are mostly used at low voltage distribution lines. The conductor is passed through the place left between the clamp and the insulator and is fixed along the groove with the help of soft bending wires of the same material as the conductor. Guy or stay wires are used with the poles placed at the dead ends or at sharp turns of the low voltage lines. To insulate the lower part of the gay wire from the pole for the safety of people, a stay insulator is placed in between the wire. This insulator is placed in the guy wire at a height of three meters from the ground. It has two holes at the right angle to each other through which two ends of the guy wires are looped in such a way that in case the insulator breaks the guy wire will not fall to the ground. Thanks for reading about overhead line insulators. #2 Which of the following equipment, for regulating the voltage in distribution feeder, will be most economical ? #5 On which of the following factors skin effect depends ? #8 In the analysis of which of the following lines shunt capacitance is neglected ? Medium as well as long transmission lines. #19 When a live conductor of public electric supply breaks down and touches the earth which of the following will happen ? No current will flow in the conductor. © https://yourelectricalguide.com/ overhead line insulators.